Easy cleaning no longer have to worry about cleaning the lens. It's a necessity to go out and travel. Lens wipes will not scratch lenses but surface grit or dirt may. Always protect your lenses by gently brushing away dust and dirt with the folded wipe first. Unfold the wipe and gently clean the surface with circular movements until the surface is clean and dry. 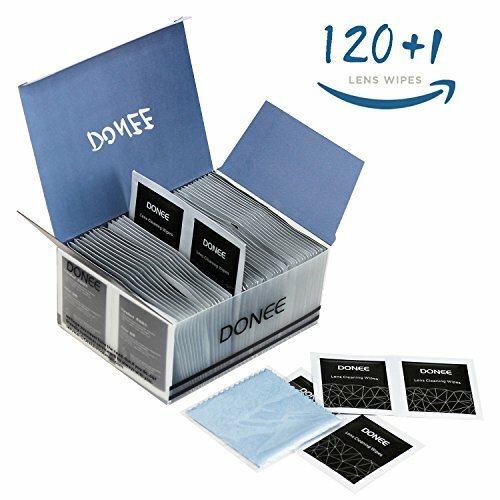 1.DONEE Lens cleaning Wipes and Microfiber Cleaning Cloths Perfect for eyeglass, iPhone, iPad, Computer, Camera, Table, Watch, LED Screen and others. With a microfiber cloth as a gift is required as part of the eyeglass cleaning for further cleaning, to meet more critical cleaning requirements. 2.Travel-Ready: disposable lens cleaners make travel a breeze, Stash them in your purse, pocket, or carryon, It can reduce the maximum your valuable space with simple, ultrathin, compact design. 3.Scratch free: Non-abrasive, antistatic micro-fine tissue lens cleaning wipes that leave zero scratches, streaks or marks on eyeglass lenses. 4.Safe and effective: Pre-Moistened lint wipes that provide thorough cleaning from all kinds of dirt gently by removing bacteria, germs, fingerprints, dust, oil, and smudges, No fibers or lint behind, Leave no residue. 5.Convenience: Disposable pre-moistened lens wipes make it quick and easy to safely to clean lenses. One step, no hassle. If you have any questions about this product by DONEE, contact us by completing and submitting the form below. If you are looking for a specif part number, please include it with your message.